SAN FRANCISCO, CA -- (Marketwire) -- 05/17/12 -- Radius, the leading provider of sales intelligence on the small business market, today announced the results of their inaugural Radius Social Small Business Report. 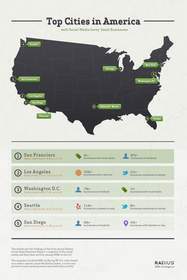 Topping the list of most social small business cities in the U.S. are San Francisco and Los Angeles, as West Coast cities overall ranked higher than their East Coast counterparts. New York ranked #7, while other major East Coast cities, such as Boston, did not make the top 20. The results are the findings of the first annual Radius Social Small Business Report, which tracks SMBs in the top 85 U.S. cities and ranks them via the Radius Social Index, a score compromised of social media presence and daily deal activity. Radius's technology collects and monitors information from more than 15 million SMBs in the U.S. and can measure social media presence by the number of SMBs with company websites, social media profiles on Facebook and Twitter, check-ins on Foursquare and Yelp reviews. It can also measure daily deal activity based on the number of SMBs that have issued a daily deal. "This report shows how small business owners in large metropolitan areas are embracing social media," said Darian Shirazi, Founder & CEO of Radius. "With our data on small businesses, we can extract valuable insights that are not only a competitive advantage for SMBs and large enterprises, but also an economic asset for a variety of civic institutions." This study is the first of many reports on the small business economy based on the Radius platform. Radius' innovative, cloud-based technology collects and monitors information from hundreds of thousands of sources via multiple channels including social, news and government sites. Radius provides the most accurate online and social data available on the SMB market. Grand Rapids, MI (29%) and Oklahoma, OK (28%) have the highest percentage of SMBs with Facebook pages. Metropolitan cities that serve as home to major daily deal companies such as Living Social (Washington, DC - .5%) and Groupon (Chicago, IL - .4%) have the highest percentage of SMBs that have done at least one daily deal. However, both cities are less than 1 percent. Buffalo, NY (20%) and Rochester, MN (20%) have the highest percentage of SMBs with Foursquare check-ins. Charleston, WV ranked last amongst the top 85 U.S. social small business cities with a score of 1.8. Radius is the leading provider of sales intelligence on the SMB market. Based in San Francisco, the company provides a comprehensive index of listings and data associated with the millions of small businesses in the U.S. to make small business-focused companies and sales teams more efficient, informed and productive. Radius provides business data, social insights, and location context about small businesses all in real-time. The technology collects and monitors data from hundreds of thousands of online and social sources, including Twitter, Facebook, Foursquare, government sites, local news sites, etc. The easy-to-use dashboards allow salespeople to discover, prioritize and track activity of leads. The company has been developing the technology for the past three years and officially launched as Radius in April 2012 to focus exclusively on the increasing demand for sales intelligence on the small business market. www.radiusintel.com.